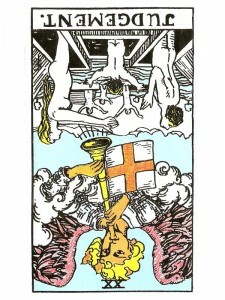 Judgement (R) says you are feeling uneasy, lonely – longing to be free of certain situations but you can not see the way out. Acknowledge when you are tired – when you are feeling low and would like to know which way to go. Make it known that you wish to answer the call but you do not know what to do. Stop fearing the unknown – review your life and make new plans for the future. Release yourself – do not allow your fears to keep you locked into this situation. Never allow regrets and remorse to build. Direct the course of your life by examining and altering any self-destructive behavioral patterns. Break away from old, limiting habitual patterns. Plant new seeds in your subconscious – be willing to try new ideas, a new job or even consider moving far away and starting over again. If loneliness is affecting your judgment – go deep within and find help. Your objections are only “excuses” which have become dominant in your life. Your life has changed – only your choice remains. The realization of your True Self will liberate you from all these self imposed restrictions. It is wonderful to know that there is a place inside of us where we can be joyful and free no matter what is going on in the external world. Discover that you will never really die – that death is only change and you will have overcome the last great illusion. Recognize that you are a Being – not a body, free to live forever in a boundless universe. Discover the guarantee of immortality and delight in the joy and happiness. You can be optimistic about the seeds you plant within yourself – given half a chance, they will grow in quite miraculous ways. The things you need will come to you in magical ways as you learn to rule your life and not be ruled by it. The divine spirit within you will provide support, guidance and everything you need for your life’s voyage – giving you the appetite to enjoy the journey. There are two stages in the work of the Self – the first stage ends once you are liberated – the second stage begins as you turn your focus on your expression and carrying out your creative purpose in life. It is not uncommon to find this card inverted, for this is a very difficult step in your evolution of consciousness. There may be a serious flaw, clearing has not been achieved. Guilt, which is part of not forgiving self, can be the result of assuming more responsibility than is one’s lot. This is seen as an aspect of the sin of pride – for it is presumptuous of us to assume too much responsibility. In so doing, we presume to be God. Amorality – lack of remorse. Inability to forgive others or self. In the first position: You will be called upon to teach many by your example. In the second position: At one extreme, you could be on shaky ground because you have made and/or allowed things to become unduly complicated. At another extreme, you may have been unduly hard on those around you and there is little motivation for them to help you. In the third position: Accept the overtures of others to heal the past and prepare the future. In the fourth position: These tapes may have been someone else’s version of what was good and in one extreme you are trying still to work with that version, in the other extreme you are rejecting it. In the fifth position: Your view of things may be a bit skewed. Another possibility is that you have decided that others have things wrong. In the sixth position: You will be feeling an inequity in your emotional house, a discomfort that you can ease by letting love and grace heal you or you can exacerbate the problem further with self-pity or self-righteousness. In the seventh position: One distortion here is that you may be planning revenge or you may be anticipating and fearing it. Here the mind may be making matters worse under the influence of the lower ego. In the eighth position: You may be passing judgement on someone at this time and it may not be correct. In the ninth position: At one extreme, this heart may be struggling with itself over its track record. At the other extreme, there is the opposite of no struggle – even less, no concern with the flame of friendship and love barely flickering. In the tenth position: You cannot do the work of others in this business of forgiveness, but you can do your part by forgiving yourself if you have wronged another. Confrontation or face to face retreading of the issue, is not always the correct choice of resolution and even when it is appropriate, forgiveness must have already taken place in the heart before the meeting. The meeting here is not the means to resolution, but merely an acknowledgement of the fact.